It seems like I have abandoned this blog but I definitely did not....I just was very busy creating a support group and website on a very dodgy laptop that slowly falls apart!! !I miss some buttons on the keyboard and the mouse doesn't work properly anymore...that's what happens if little hands get a hold of it!! Anyway somehow I have managed to get it done and we are now live!! Although it is based in N-Ireland it welcomes heart parents from everywhere so please join if you want. I am still working on it so bear with me...I should get my new laptop today hopefully and that would help a great deal!! Dounya, my inspiration to all of this, is doing great.She makes her presence very well heard and loves to sit next to me while I am typing away. In fact everybody in our family is doing great and I am feeling blessed and happy!! Dounya's 1st cardiac appointment after her surgery and sadness in N-Ireland. she had. They will keep an eye on it to make sure it will not increase. We also can stop giving her the diuretics which is great...she is now officially medicine free!! She has to come back in 4 months time so all in all it was a good appointment!! 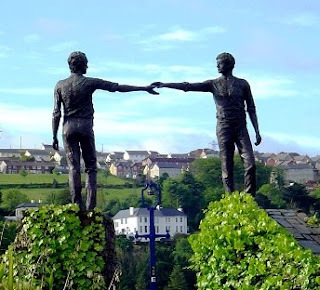 It is a bit of an strange time now here in Northern-Ireland after everything that happenend in the last couple of days. Useless killings by a group of people for whom I really don't have a polite name to call them.. Why do they want to put people back in misery and sorrow? I feel so sorry for the young men and the police officer that lost their lives and my thoughts are with their families. The police officer was killed near where we live and close to the school my boys go. The whole community here is feeling sad and angry over this because they went trough a lot during the Troubles and they certainly don't want to go back to that time! Hopefully these horrible events will unite the people in Northern-Ireland in their effort to keep the peace process going. no more Infantrini, no more app.with dietitian!!! Dounya's weight is now 15lb05oz or 6820 grams! Just got of the phone with the dietitian and we can stop with the Infantrini milk and give just regular formula and it is not necessary to see the dietitian anymore, unless of course I am worried about something!Fantastic...it means Dounya is really doing well which I thought was the case already.The scar has healed also nicely and she starts to enjoy lying on her tummy which is a good sign. I am a bit nervous for Tuesday but surely it will be OK ...I got nothing at present to worry about so that must mean her heart is working properly. I will be just glad when the Doctor will confirm this!!! wow how the time flies by...I really try to keep this blog up to date but somehow the days have not enough hours to do everything I want.....yep that is having four little children who all wants their attention!! Last Saturday the 21st of February our Chadi turned 6...another example of how the time seems to pass so so quick..my baby is not a baby anymore but a little man. he is doing very well, although sometimes he can still be quite difficult in his behaviour. He is learning every day and I definitely see progress. He goes now twice a week to an after school playgroup to get him to interact more with other children in a different environment. At first he loved it, then he did not go for a week because he was not well. So the routine got broken and he refused a couple of times to go but today he was eager to go ...a good sign! Dounya is wonderful and a picture of health so far as I can see. Tomorrow she will be weighed again but I do not worry about that anymore, oh joy!! So things are going well here. I miss Holland sometimes even though I consider here home now. But I miss sometimes stupid tings like bicycles everywhere, the Dutch frankness, chocolate sprinkles for breakfast and Dutch cheese!! !haven't been back since we moved here so it might be time I think! !